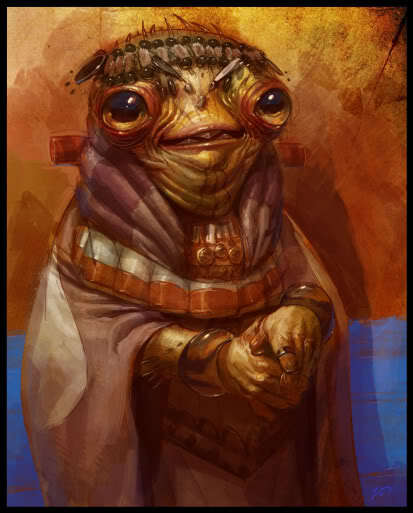 The Attheri are currently the most powerful species in the galaxy. Also known as Traders, they travel about, providing spacefarers with the drug Vetoni, which is required to survive a Jump in a JumpShip. They are the inventors of of Jumptech, but have distributed the secrets of this technology among all other spacefarers; they maintain their control of the galaxy through keeping the secrets behind the drug Vetoni a well-kept secret. Each Attheri is unique in appearance; those unfamiliar with the species would assume each one to be from a different species. Some are predominantly humanoid; others combine humanoid features with nonhumanoid features (blobs sprouting limbs, faces, or even heads); some are mainly non-humanoid; and finally some which seem to be unstable biological structures. The latter are reported least often (although most spacefarers who deal extensively with the Attheri claim that this is not because of rarity but rather because the Attheri conceal such specimens, presenting only those with whom they feel humanoids are more comfortable dealing). The most common type of Attheri seems to be the second, which combines humanoid and non-humanoid features. A “Moroginh Merchant” by Deviantart user IzzyMedrano. Click for source. 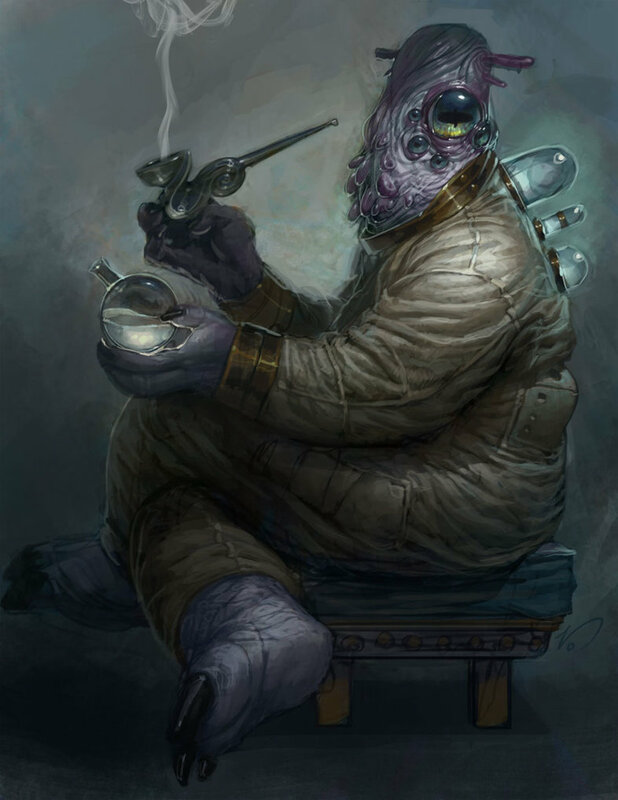 The Attheri are not uncommon, and can be found at many spaceports and stations, ready to sell their wares. While they are not highly territorial (their goods are in such high demand that this would be unnecessary), they tend to frequent the same stations or centers. They are normally conversant in whatever language needed, and when they wish they are amazingly able to comply with the customs and etiquette of their many-raced customers. The Attheri’s power in the universe is not without consequence, of course.They are hated and feared, but also admired by some. It is not known whether they originate within the galaxy, or hail from farther off. In any case, they have dominated the galaxy which Humans call The Milky Way since as far back as anyone can remember. Outsiders suspect the Ktiath of secret dealings with the Attheri superpowers, and many whisperings are heard about how the Aakaal brim with hatred for the rulers of the galaxy. Humans, unable to face the Attheri, chafe under their power. The Stethavini, free spirits as they are, pay little mind to the Attheri when they don’t need to. Meanwhile, the Menchanu are surprisingly quiet in galactic circles about their feelings toward the local tyrants. And as usual for the Hybloods, nothing is certain, but anything and everything imaginable is rumored. “Von Borkus the Spice Trader” by Deviantart user IzzyMedrano. Click for source.